It's Friday night and I'm in the Phoenix area and I'm thinking I should do something. 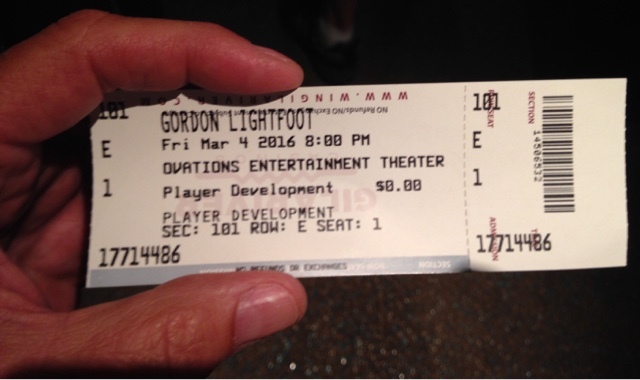 I'm at the Wild Horse Casino walking around and see that Gordon Lightfoot is playing the house tonight. I walk up to the ticket counter and ask if they have any tickets and I'm told they are sold out. I then ask if they may release tickets and the guy said they may. I decided to stand off to the side to see if anyone was selling tickets. Off on an angle there is s guy selling a ticket so I wonder over but the transaction was done and no more tickets. I decide to wait a bit longer and a guy asks me if I am looking and I said yes. He has two to sell and I am a single. Vi told him I would hang out a bit longer and he could try to sell the two and if not I would buy one. He thinks for a couple seconds and says he will just sell the one to me for face value of $60.00. I agree and the cash sale is done. Then he says here is a wristband for the meet & greet after the show back stage. He said he would just give that to me. 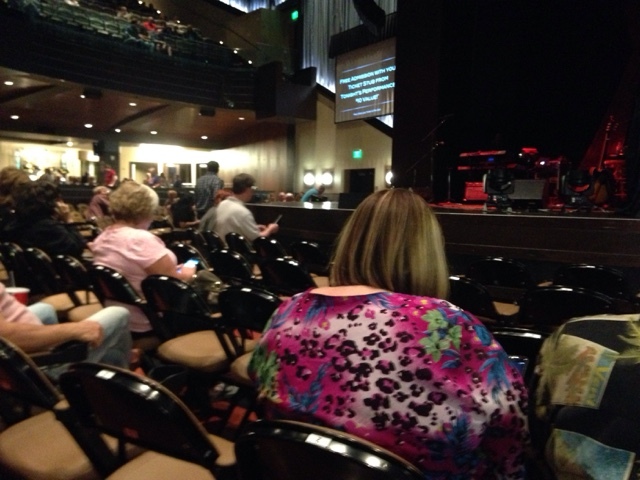 I have row E, so 5 rows from the stage and all the way to stage end. Good seats to me. 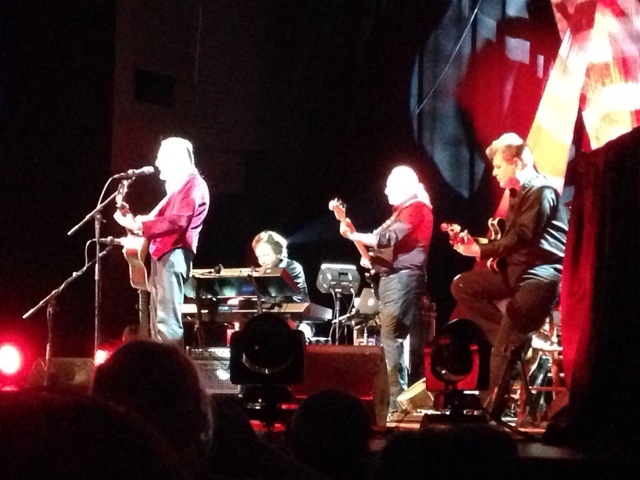 It was a good show and Gorden is 77 now. Where did the years go. A local fan favorite was Carefree Highway, named after the road north of Phoenix. Gordon told us he was headed down I17 from Flagstaff many years ago and saw the road sign and thought that the words were deserving of a song and wrote it in a few hours. My seat was near the back stage door so I was first inline to meet Gotdon and shake his hand and tell him how I appreciate his music. 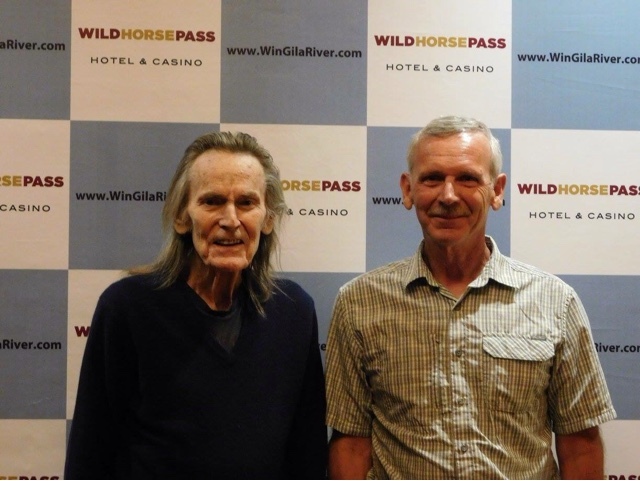 It was a by chance situation that I ended up at wild horse casino, by chance in getting tickets, and by chance getting to personally meet Gordon Lightfoot. It's interesting how some things just fall together. For John M, where I used to work, Gordon did sing the Edmond Fitzgerald and I knew someone other than me knows how many times the bell tolled on the Maritime Saylors' Cathedral for the crew. For the rest of you its 29 times. Gordon doesn't have a mustache anymore? What the heck?!?! ?